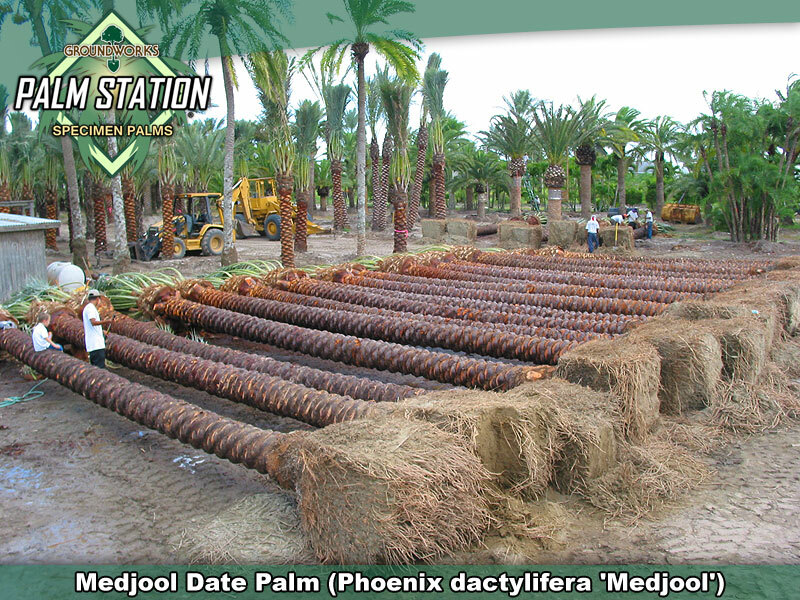 Groundworks stocks hundreds of gorgeous Specimen Medjool Date Palms in sizes ranging from 8’ to 25’ of clear trunk. Thick canopy of silvery green to dark green. 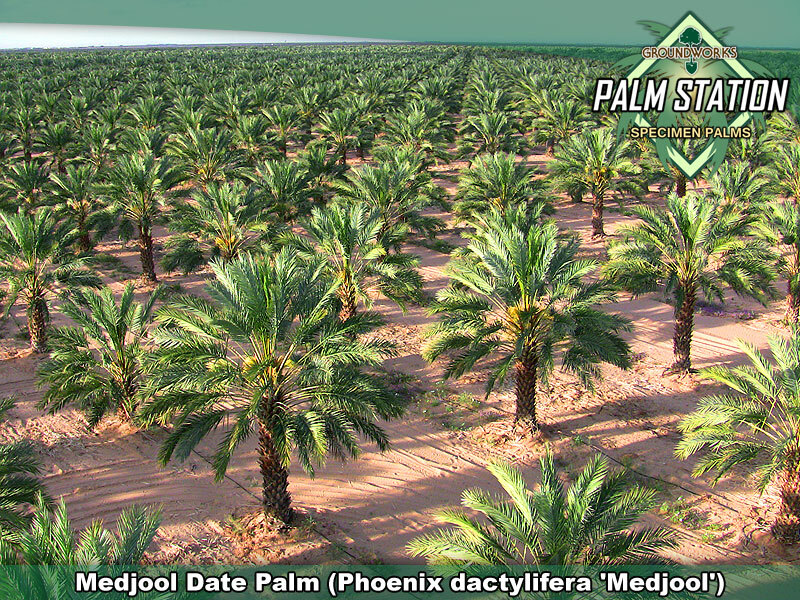 Wide leaflets and a high frond count give Medjool Date Palm canopies a lush, stunning appearance. Canopy spread after one year on site, 25 feet from frond tip to tip. Average trunk caliper of 18-20 inches. The petiole layer is removed by hand using the "Classic Cut" harvesting method. Classic cutting yields a distinctive raised diamond shape trunk appearance that is beautiful and functional. 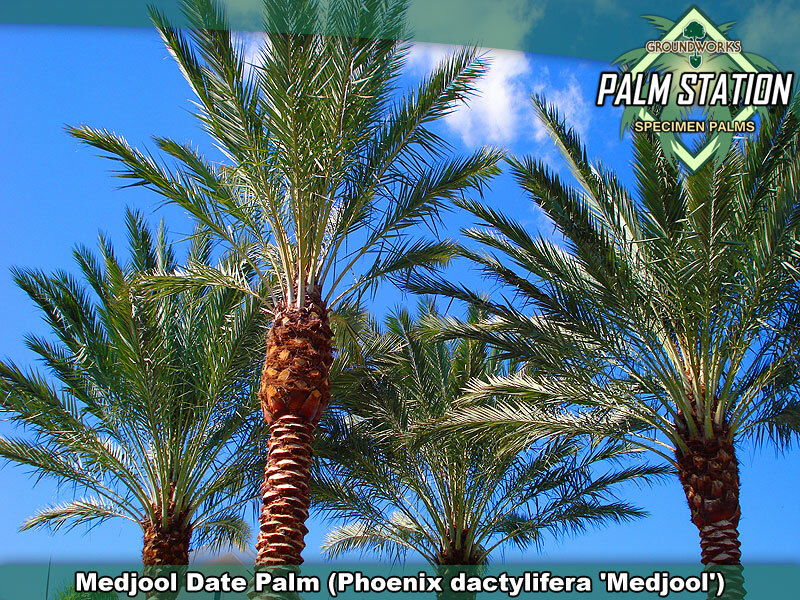 Medjool’s are all around magnificent palms that blend well with a wide range of other landscape materials. 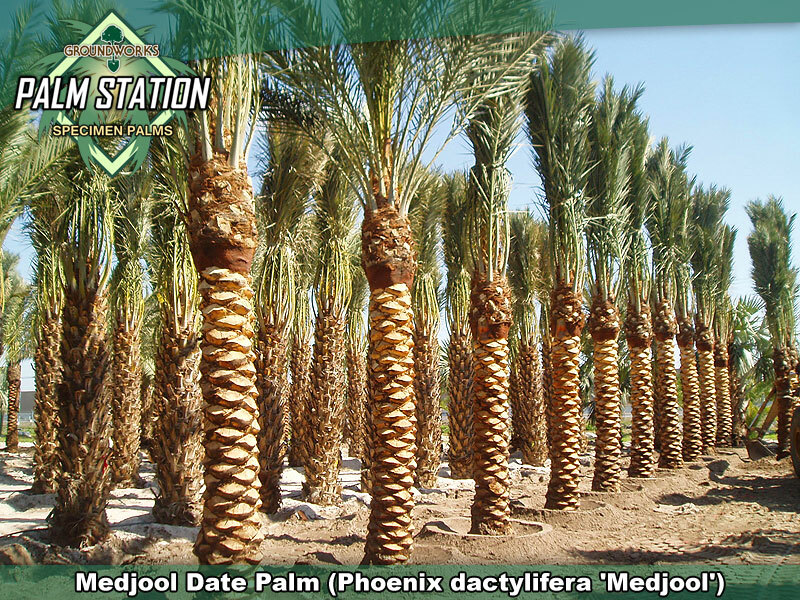 “Medjool” is a sub variety of Dactylifera in the genus Phoenix. The Medjool sub variety is a native to the Atlantic coast of Morocco. This particular sub variety is a proven performer that is far superior to most other varieties of Dactylifera when utilized under sub tropical or tropical conditions. 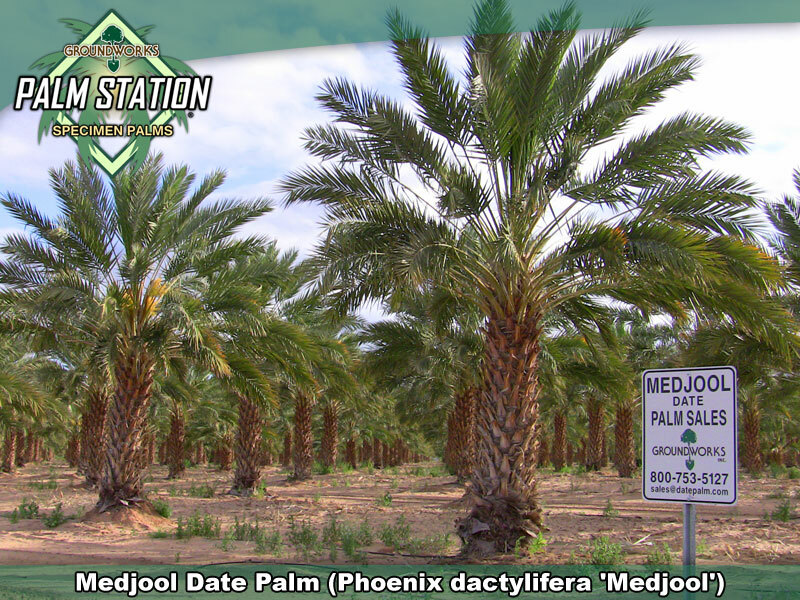 The venerable Medjool Date is produced in California and Arizona for its excellent fruit and was introduced for use in landscaping in 1990. 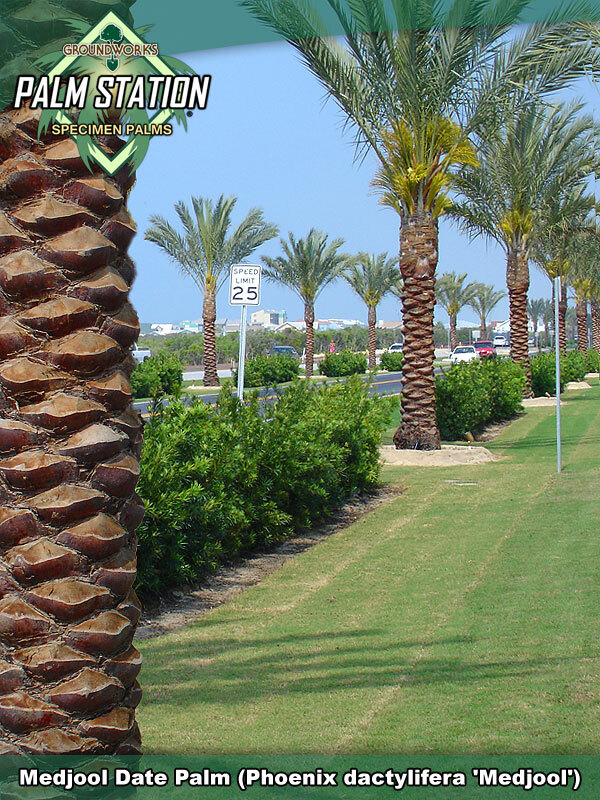 The original applications were in Southern Florida but its use soon spread and this sub variety has since proven itself to be absolutely reliable for ornamental applications in California, Arizona, Nevada and from Texas across to Florida. Hundreds & hundreds of specimen Medjool’s have also been exported during the past 20 years and are thriving today all over the Caribbean and in places like Venezuela and Panama. Generally, once established this species is totally reliable everywhere that winter temperatures do not fall below 15 degrees and then stay down there for 6 hours or longer. Medjools are not all that picky about the soil conditions they thrive in but there are a few very important rules that installers will want to adhere to when planting in heavy soils or in regions where the irrigation water has a Ph value below 7. There are also simple specialized instructions for direct beach sand plantings and high water table installations. 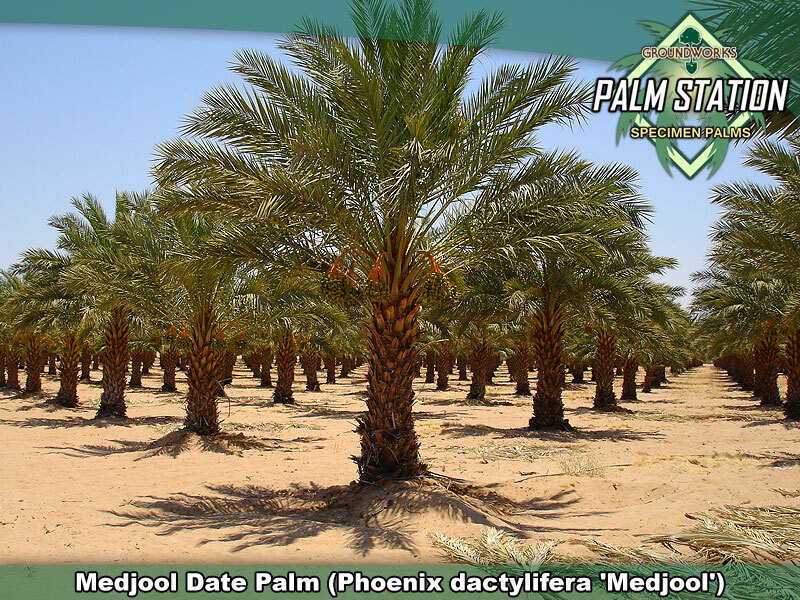 By and large, Medjool dates will thrive anywhere that winter temperatures don’t reach and stay below 15 degrees and even where the entire canopy does burn back during an extreme freeze event, established palms will fully recover with minimal care 95% of the time. 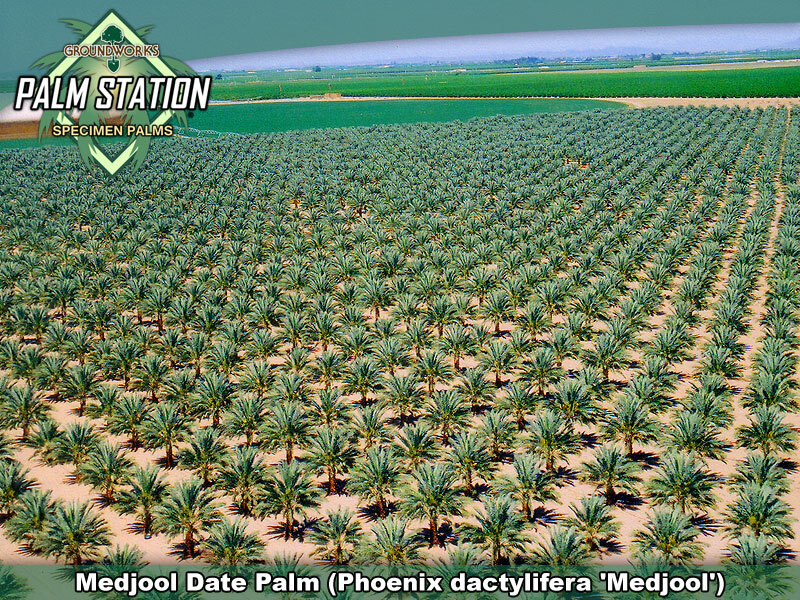 Medjool Dates palms prefer full sun environments. The goal irrigation wise is the establishment and maintenance of a wet to dry, wet to dry cycle in the upper 24” of soil layer. The number 1 one “problem causing” issue with Medjool’s on site is inundated conditions at the surface. Where the surface stays constantly wet, Medjool’s will not do well so if your site is constantly wet at the surface, you are better off selecting a different species. A high water table that reaches up to 24” below the surface is not a problem with this species; the issues only occur if the water table is within 24” of the surface. USDA Zones 9 - 11. 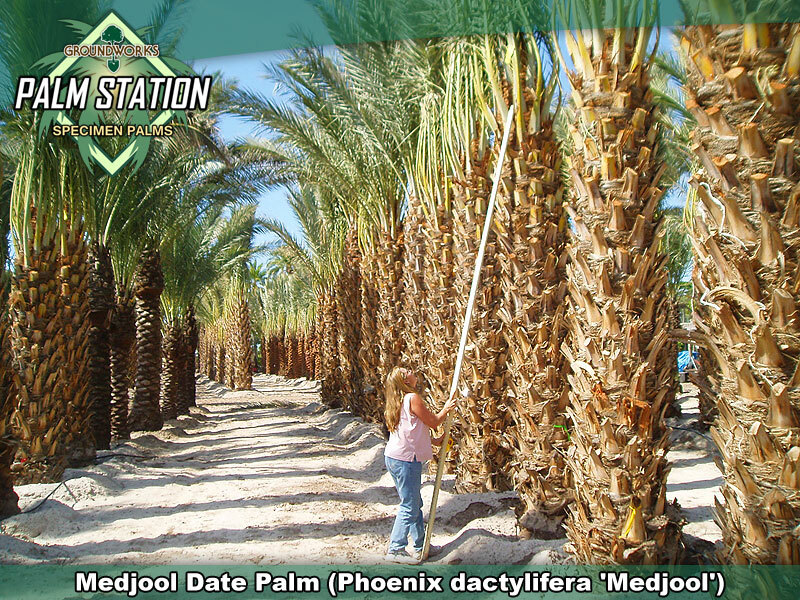 In Zone 8, palm enthusiasts grow Medjool’s in sheltered locations but occasional freeze damage to foliage can be expected up in Zone 8.Anywhere below zone 8 is safe and in our experience, this species will come through the winter with little or no frond damage whatsoever. Groundworks stocks hundreds of gorgeous Specimen Medjool’s in sizes ranging from 8’ to 25’ of clear trunk. Where unusual curves are required, we can special order them and then set the palms up for your inspection and hand selection at our nurturing facilities in Alvin or Spring Texas and at our Boynton Beach Florida nurturing facility.